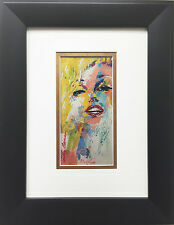 LeRoy Neiman's "Marilyn" - Fine Art Print. Plate Signed by Neiman and Marilyn. This print is. Both have been replaced with acid free boards. Excellent presentation. As shown in the photos the back of the print is incorrectly described as NBA superstars. LeRoy Neiman's "21 Club Bar". Fine Art Print. This print is. BY LEROY NEIMAN. "DRAKE RELAYS". THIS PRINT WAS THE ART WORK FOR THE ADMISSION TICKETS TO THE 1979 DRAKE UNIVERSITY RELAY RACES. ORIGINAL PRINTING FROM 1979. (1921 - 2012). 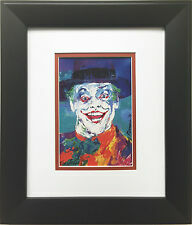 LeRoy Neiman's "The Joker" - Fine Art Print. This print is Double matted in Gold/Off-White. 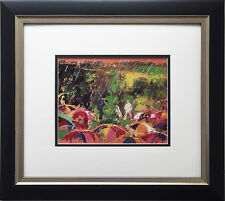 LeRoy Neiman's "Arnie In The Rain" - Fine Art Print. - Originally Created in 1973. Originally Created in 1978. This print is. Leroy Neiman (1921-2012) was the official artist of five Olympics in addition to being one of the most collected artists of the 20th century. The prints were placed in permanent storage. Never released, these prints have been kept and preserved for over 30 years and unavailable for sale. LeRoy Neiman's "ROCKY" - Fine Art Print. This print is Double matted in Blue/White. LeRoy Neiman was there, recording the action on the field. The artist first paced on sideline and later the other, furiously sketching the contest from every angle. "In the Pocket" depicts a crucial play during the second quarter. LeRoy Neiman's "Minuteman" - Fine Art Print. Plate Signed by Neiman. This print is. This print is Double matted in Blue/off-white. 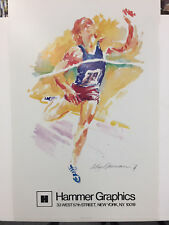 LeRoy Neiman's "Olympic Runner '72" - Fine Art Print. This print is Double matted in Blue/White. 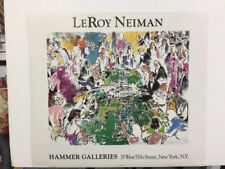 This is a great open edition offset lithograph of a painting by Leroy Neiman (1921 - 2012). No Reserve! LeROY NEIMAN'S "ELVIS PRESLEY II". This piece is "Double Signed" - It has a Plate signature and a HAND SIGNATURE with a black marker. The two Restaurateurs took Neiman by surprise. They handed LeRoy the gold and said, "now will you finish our painting?". LeRoy confessed that one of the reasons for the delay was that the size of the F.X. McRory back bar was a challenge to get onto canvas. LeRoy Neiman's " Basketball Superstars" - Fine Art Print. This print is. LeRoy Neiman's "Fred Astaire" Art Print. This print is Double matted in Black/Cream. LeRoy Neiman's "Ali-Foreman Round VIII - Zaire". Rumble in the Jungle - Fine Art Print. This print is. Plate Signed by Neiman. Fine Art Print. 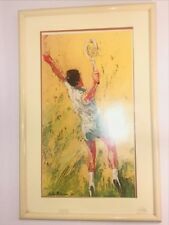 LeRoy Neiman's "P.J. Clarke's" - Fine Art Print. Above LeRoy and to the right: Pat & Richard Nixon; Elizabeth Taylor. 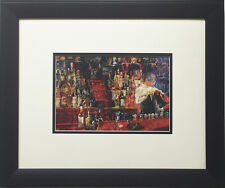 One of Neiman's most popular bar scenes -. Above the Nixon's and to the right: Henry & Nancy Kissinger; Frank Gifford. Plate Signed by Neiman. This print is. LeRoy Neiman's "Roulette 1972" - Fine Art Print. Great Roulette Scene in this artwork that includes a Self-Portrait of Neiman himself Gambling. - Originally Created in 1972. This print is. LeRoy Neiman's "New York Marathon 1987" - Fine Art Print. - Originally Created in 1987. This print is. LeRoy Neiman's "Elvis" - Fine Art Print. This print is Double matted in Crimson/Off-White. LeRoy Neiman "Wilt Chamberlain & Bill Russell" CUSTOM FRAMED Celtics 76rs Phila. 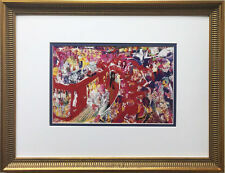 LeRoy Neiman's "Kool Jazz Festival" - Fine Art Print. This print is Double matted in Blue/Off-White. LeRoy Neiman's "Winter Olympics - Lake Placid 1980". Plate Signed by Neiman. Fine Art Print. LeRoy Neiman. Original Silkscreen. Hand Signed and numbered by Artist. Image Size 7874 x 97.16 cm. Edition Number HC 168/200. Leroy Neiman. " Harlequin ". Original Signed and Numbered Limited Edition Lithograph. Rare : Published in 1972 Sold Out Edition . LeRoy Neiman's "Pour Vous" 1977. Plate Signed by Neiman. Fine Art Print. This print is. LeRoy Neiman's " LA FORUM LAKERS " 1972. Plate Signed by Neiman. Fine Art Print. This print is. This print is Double matted in Gold/White. LeRoy Neiman's "Duran-Leonard III ". Plate Signed by Neiman. 16.5" x 18.5". 1989 At The Mirage Casino Las Vegas. - Originally Created in 1989. LeRoy Neiman's "Opening Ceremony, Olympic Stadium, Munich, 1972" - Fine Art Print. This print is Double matted in Gold/Off-White. LeRoy Neiman's "Tour De France" 1979. Plate Signed by Neiman. Fine Art Print. This print is. LeRoy Neiman's "John Lennon" Art Print. Plate Signed by both Neiman and Lennon. Great for any Beatles Fan - The artwork features John Lennon with the Lyrics to "Imagine" written around him. This print is. LeRoy Neiman's "End of Ali-Frazier Fight 1971" - Fine Art Print. - Originally Created in 1971. This print is. LeRoy Neiman's "La Grand Cuisine " - Fine Art Print. This print is Double matted in Blue/White. BY LEROY NEIMAN. Serving Only The Best Since 1983. signature in plate. LeRoy Neiman's "Rolls Royce Central Park & Monte Carlo Rolls ". Both are Plate Signed by Neiman. - Rolls Royce Central Park Created in 1984 as an Acrylic on board. - Monte Carlo Rolls Created in 1986 as a watercolor on paper. LeRoy Neiman's "Bird and Diz" Art Print. Jazz Legends: Charlie Parker & Dizzy Gillespie. Double matted in a Burnt Orange/ Off-White. - Originally Created in 1973. LeRoy Neiman's "Ali-Foreman '74 Zaire" - Fine Art Print. 16.75" x 13.75". This print is. LeRoy Neiman's "Bethesda Fountain - Central Park" - Fine Art Print. This print is Double matted in Gold/Off-White.